Randy Peyser (RP): You went from poverty to creating great wealth. What’s your secret? 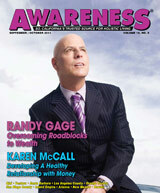 Randy Gage (RG): Prosperity is managed by living in accordance with universal law. In order to manifest true prosperity in your life, I believe there are 7 laws by which we have to live. RP: Can you talk about these laws? RG: The first law is the Law of Imaging. Prosperity is created in your mind first. Napoleon Hill taught this in Think and Grow Rich. You image things in your conscious mind through programming your subconscious mind. We know the subconscious mind doesn’t analyze, rationalize or argue. It just does what it’s programmed to do. So, the prosperity manifestation formula would be to plant the seeds, water them with emotion and repetition, and then harvest them. Using the Law of Imaging, you can create visual images, such as a manifestation or prosperity map, or a dream board. Or put pictures on your refrigerator of what you want. By putting an image in front of you, even if you don’t look at it directly and it’s just in your peripheral vision, it’s slowly imprinted in your subconscious mind. If you see it every time you go into your closet or every time you wake up or go to bed at night, it’s going to work on you. You can incorporate other modalities as well. For example, you can make an audio for yourself. When you are in an alpha state, your subconscious mind is most conducive to programming. As you sleep you will go into an alpha state several times. That’s why I listen to subliminal CDs that play all night while I sleep. RP: Not all, but many people on a Mind, Body, Spirit path struggle. So they create a dream board and affirm that they are going to make a million dollars. Is it possible to actually manifest a million dollars if you’re coming from a place of struggle? RG: Yes, it is possible to go from a place of struggle to manifest a million dollars. I know because I did it. But that does not work for many people. Here’s the key: success comes from frustration. Eric Butterworth called it “divine discontent” where you are not happy with your state of life and you have this guidance that’s pulling you to want to do, have, or become more. Successful people do a good job of managing their frustration. I’m really successful. I live my dream lifestyle, live in my dream home. I’m a multi-millionaire. I’ve got my dream cars. And you know what? I’m frustrated that I am not even more successful. I have more things I want to do. Let that frustration pull you toward your dream or your goal that you want to accomplish. If your subconscious and conscious mind can believe it’s possible, then it pulls you to it. But if you’re in debt and unemployed, and you say, “I want to be a millionaire by next week,” you don’t believe that. You can put it all over your dream board and affirm it, but your conscious mind is going to rebel like crazy against that and you probably won’t program your subconscious mind with that. When you do it in believable stages, then you really can get that emotional anchor in your subconscious mind and it pulls you toward it. Your goal should be something exciting enough that you want it to pull you toward it. But it’s got to be something that you really can do. Make sure what you’re striving for is bold and daring enough to excite you, but is still practical enough that you can do it by stretching yourself. RP: What do you mean by stretching yourself? RG: Your goal or dream has to be bigger than you are right now. If you want a goal that is really going to excite you and pull you towards it, you need a goal that you are going to have to become more for in order to achieve it. RP: I think one of the reasons people don’t achieve prosperity is that, at some level, they have a sense of unworthiness that prevents them from being able to receive more. RG: Ninety percent of the work I do with people regarding prosperity goes back to unworthiness issues. At a core level, many people don’t believe they’re worthy. RP: How can we deal with this? We have to identify these memes and eviscerate them. Then we need to replace them with a positive program. For instance, you could have the mind virus that “to be rich, I have to be a bad parent.” Is that true? No, there are lots of wonderful, wealthy parents. You’ve got to change that core belief or you will continue to self-sabotage your prosperity. RP: Tell us about more of the Laws. RG: The Law of Circulation is based on the idea that hoarding leads to a recession. When you circulate prosperity, it’s like a free-flowing river. For example, suppose you’re down to your last $200 and you want to hoard it. That won’t make you prosperous. I recommend that you break it up and circulate it. Pay some money to the electric company, and some to the landlord, and tithe something. Put yourself in the circulating flow of prosperity. This leads directly to the Law of Reciprocity, which states that what you give comes back to you multiplied. You can’t “out-give” the universe. The more you give, the more you get back. It’s a self-perpetuating increase situation. RP: Can you give an example of how you’ve applied these laws yourself? The following day, I received a refund check for $75 from the power company, along with a letter that thanked me for being a long-term customer who always paid my bills on time. The truth was: I had never paid my bill on time, and my power had been turned off three times in the past! There is no reason I should have gotten that refund, but I still say it had to do with my putting that dollar in the basket — even though the check had been sent to me before I made that tithe. I took $7.50 from that $75 refund and tithed it. The next week, a guy who owed me $200 and who had left the country three years before, hunted me down and paid me the money he owed me. I’ve been tithing 10% of everything I make ever since. For the 20 years I’ve been doing this, I’ve had an increase in my earnings every year. RP: How did you accomplish all of this? RG: I changed the way I think. Poor people think differently than wealthy people. Healthy people think differently than sick people. Happy people think differently than depressed people. I was sick, depressed and broke, and I realized that I had to change the way I think. I spend time in daily self development every morning. I don’t answer the phone or leave my house until I have my consciousness vibrating at the level I want it to be at. When you do this, you attract people who are vibrating at that level as well. RP: What kind of practice do you do? RG: I like to read or listen to audios or videos. Or I meditate or pray or do cardio. RP: How much time do you do this every day? RG: Thirty minutes. When you do it for a week or two, your life gets much more organized. You actually wind up having extra time because you plan your day, you have a program of what you want to accomplish, and you’re more productive. RP: I’m curious about the Vacuum Law. RG: The Vacuum Law is based on the idea that nature abhors a vacuum. If you walk along a sandy beach, a wave will fill in your footsteps. Because the universe is inherently good, when you create a vacuum, it allows the universe to fill it with good. If your prosperity is blocked, ask yourself, “What am I hanging on to that I need to release?” If you’re in a negative, dysfunctional relationship there’s no room for the universe to give you a good relationship. If you want new clothes, clean out your closet. Give away what you are no longer wearing to people in a homeless shelter. Another important law is the Law of Forgiveness. This is important: if you have revenge in your heart, there’s no place for love. When you’re holding onto revenge, that hurts you, not the person you are not forgiving. You are also holding your own prosperity away from yourself. You have to be willing to forgive others, and most importantly, you have to be willing to forgive yourself. That’s where a lot of worthiness issues come from. RP: Can you give an example from your own life as to how you have applied the Law of Forgiveness? RG: I got shot in a robbery. RG: I woke up in a hospital and a doctor told me, “We took the bullet out, and while we were there, we took out your appendix.” I said, “Wait a minute. The bullet is on this side, and the appendix is on the other side. Why did you take out my appendix?” The doctor said, “It’s just standard procedure whenever we open somebody up.” I said, “You’re telling me you cut an organ out of my body without even asking me?” I was apoplectic. Then, for the next two years, I was constantly sick and my body wasn’t healing. I saw specialist after specialist. Finally, I went to a GI doctor who discovered the bullet was still inside of me. He mentioned it to me and asked if it hadn’t been removed because it was right next to my spine. It finally made sense why I’d been sick all that time: My body was trying to get rid of the bullet. I had to pay cash for another operation to remove the bullet. Can you imagine how I felt about the original doctor who told me that he’d taken out the bullet and hadn’t, and who cut out my appendix without even asking? I had personal injury attorneys lined up ten deep by this point. Then I picked up Catherine Ponder’s book, The Dynamic Law of Prosperity, and opened a page at random to see what message might be there for me that day. I opened to a page on forgiveness. There was even a comment saying that if you sue somebody, how can you forgive them? The truth was that these doctors and nurses had saved my life. I was going to die. They did the best they could. So I forgave them. I also forgave the crack addict who shot me. He was hopped up and looking for his next fix. He was doing the best he could with what he had to work with. I had to forgive them for my own health and my own prosperity. RP: Was that a turning point in your healing? RG: It was. For two years, I’d have night sweats or wake up ten times a night. After I did this forgiveness work, I slept peacefully all the way through the night for the first time. I had the operation two weeks later, but I really felt like the healing started as soon as I forgave them. RP: Can you talk about the Law of Ideas? RG: Charles Fillmore, founder of Unity, taught that our Creator has surrounded us with spiritual substance everywhere in the world. The way we manifest this prosperity into the physical realm is through the power of ideas. I believe that nobody has a money shortage. The only thing they would have is an idea shortage. True prosperity is always a value-for-value exchange. You create value for the universe and the universe will reward you in multiples back. So, when you’re not manifesting as much prosperity as you’d like in your life, you need an idea as to how to create value. There is so much money, so much love, so much happiness, so much health — all true prosperity is infinite. We have to create a value-for-value exchange to attract it to us. The way we do that is through the power of ideas. RP: What would you say to all of the people in fear around their financial circumstances or the state of the economy? RG: Feel fear; profess faith. Take time every morning to read books and program your consciousness for the positive. Don’t fake it until you make it; “faith it” until you make it. Build up your faith. Create that positive expectation. Then as you go into your day, you’ll manifest more prosperity in your life.